Vyapam Middle School Teacher Jobs. 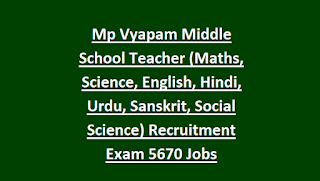 Online applications for this MP Vyapam Middle School Teacher Jobs recruitment will be available from 28-09-2018 to 30-10-2018. There are total 5670 Middle School Teacher s Jobs in this MPPEB Recruitment 2018. Available Subjects is Hindi, English, Maths, Science, Social Science, Urdu and Sanskrit. 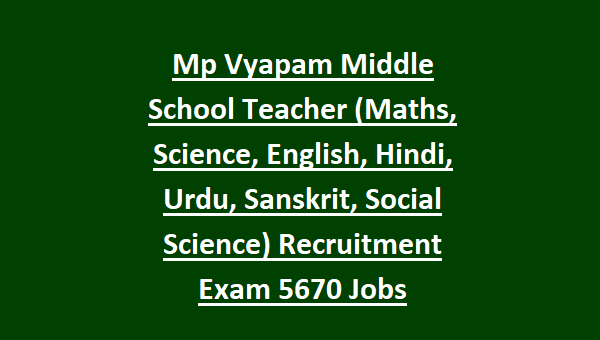 Candidates selection for this MP Vyapam Middle School Jobs Recruitment 2018 will be based on written exam only. Written Exam date is 19-01-2019 for this MP Vyapam Madhyamik Shikshak Jobs. MP Vyapam Middle School Teacher vacancy exam pattern and syllabus, how to apply online and other details are given below. For category wise and district wise vacancies refer official website. Degree with B.Ed or B.El.Ed or D.Ed or BA B.Ed or B.Sc B.Ed qualified candidates are eligible to apply online for this MP Vyapam Madhyamik Shikshak Jobs. For General Male candidates age limits are 21-40 years and for all other candidates age limits are 21-45 years. Selection for this MP VYAPAM Middle School Teacher recruitment eligibility test 2018 will be held based on objective type written exam and documents verification. Written exam will be conducted for 150 marks. Exam duration is 150 minutes. MPPEB Middle School Teacher Eligibility Test 2018 Exam consist of two parts. Written Exam consists 4 sections. Apply online @peb.mp.gov.in on or before 30-10-2018. MP Vyapam Exam Pattern and syllabus, Shikshak exam admit card release date, exam answer key and other information will be available in this website only. Click here to apply online for the MADHYA PRADESH Vyapam Middle School Teacher Recruitment 2018.